Pixar’s latest feature Up was released to cinemas yesterday and, with it, a teaser trailer for next year’s Toy Story 3. Toy Story 3 will be released in June 2010. If you have noticed that things have been rather slow around here again it is because I am struggling to do two things at once: build a new Antikewl Daily whilst keeping this old one populated with fresh content. Yes, you did hear me correctly; this site is getting its very first design! 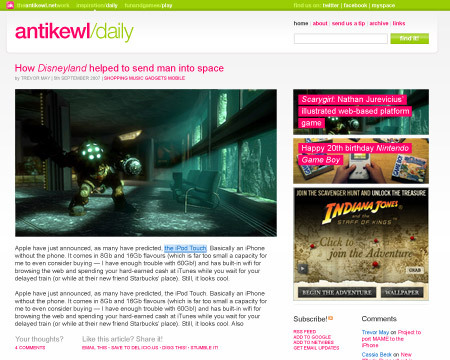 Since becoming a blog in 2003, antikewl.com has worn numerous off-the-shelf themes on both MovableType and WordPress before settling on an increasingly cobbled hack of the PlainTxtBlog theme in 2006, now it is just too big (and wobbly) for its boots. You might have noticed a few extra features that I have added already like the ability to subscribe to comment replies, links to related posts on every article and short urls… but these are just the beginning! Keep your eyes peeled for the new Antikewl Daily soon but, in the mean time, I apologise for the lack up updates. Bear with me! Also, there is a little peek at the top of the mockup of the new homepage above — what do you think? 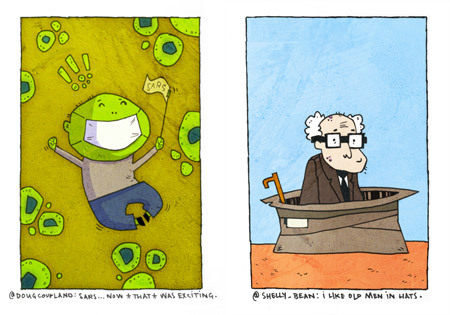 I mentioned Sam Bradley, the guy who’s been doing the illustrated social experiment on Twitter, a week or so ago. 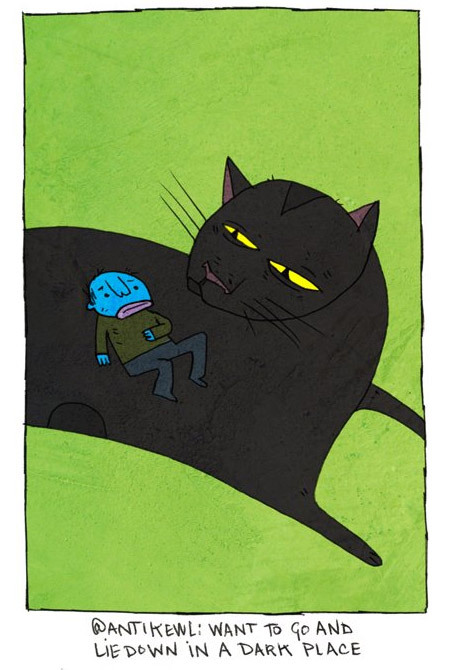 Since then he’s put all the illustrations he’s produced up on their own website, SWFT.ca, and added me to the ranks alongside such glitterati as Douglas Coupland and Drawn’s Robot Johnny. Might need to lighten up the tone of my tweets though — I appear to have been depicted as a miserable tiny balding man! 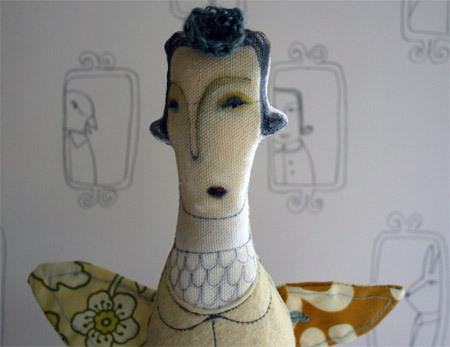 Browsing through my backlog of blog feeds this morning a post by Nick Asbury caught my eye. 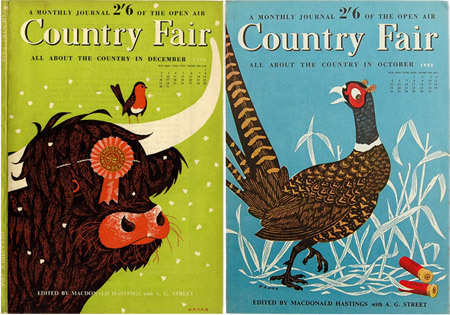 He was looking for more information about the illustrator who created these beautiful covers for Country Fair magazine, signed “Hanna”, in the 1950s. By the time I had found the post he had already managed to discover that it was an Australian artist by the name of John Hanna who lived in England from 1948 to 1962. Artist Sam Bradley has started a new social art project: He’s pledged to illustrate, four times a week, an individual tweet from the social networking site Twitter. He hasn’t set up a site for it yet (I’ll update this post when he does) but you can see his drawings as he posts them on his Twitter stream @abysmalred. National Geographic Magazine: What’s in an American Name? 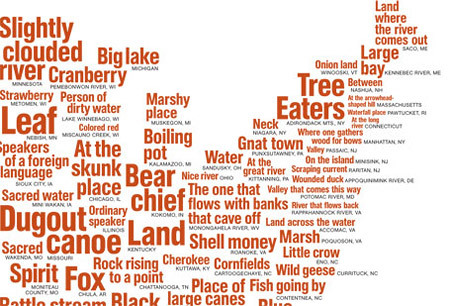 Native American words echo in the names of lakes, rivers, mountains, states, cities, and small towns across the United States. The first settlers, who put many European words on the map, also borrowed names from local tribes. They often mispronounced what they heard—that’s how the Washoe word dá’aw, or lake, became Tahoe. 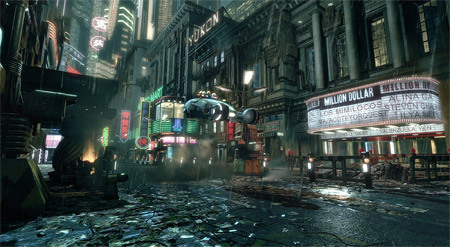 It’s no secret that Blade Runner is one of my favourite movies so I’ve just been salivating looking through some superb images created using Sandbox 2 and CryENGINE 2, the video game engine used for the first-person shooter Crysis. 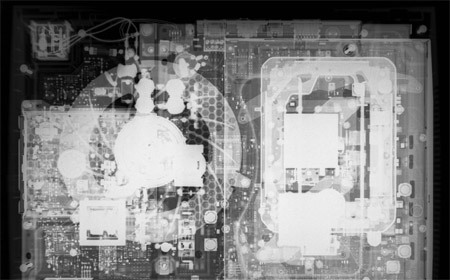 Ever wondered what your SNES looks like under an x-ray? Yeah, me neither. This guy did, though, and has managed to scan the insides of a whole range of consoles from the Atari 2600 (mostly empty) to the Wii (with accessories, no less) and the Playstation 3 (pictured above).